We designed this site, and especially the archive, to be intuitive and friendly to all users. Here’s a quick explanation of some of the features, and how to casually browse versus find something. When you land on the Browse page, all the photos in the archive are displayed, thirty to each page. You can narrow the results by applying different search criteria (found on the left) and by typing in key words and phrases in the top search bar – or by doing both! For instance, if you are from Jefferson County and interested in all the photos from that area, select Jefferson County underneath County. You could also pick Carthage from underneath Town, and a type of work, such as manufacturing, mills, and factories. Play around with the different search criteria – you can go very broad (just a time period or a whole county) or very granular (work, county, town, time, special subject). If you would like to remove all search criteria and start from scratch again, press the “clear search” button underneath the left column of search criteria. A note on special subjects: these are subjects we chose to tag photos with, because we saw them often enough or wanted to draw them out. For example, “women and girls” is a tag we applied to all photos with women or girls in it, because the majority of our work photos feature men. “Horse” is a tag we applied to any photo with a horse in it, “automobile” is the same. You can filter by season (“winter” is an especially fun category). Try them out! 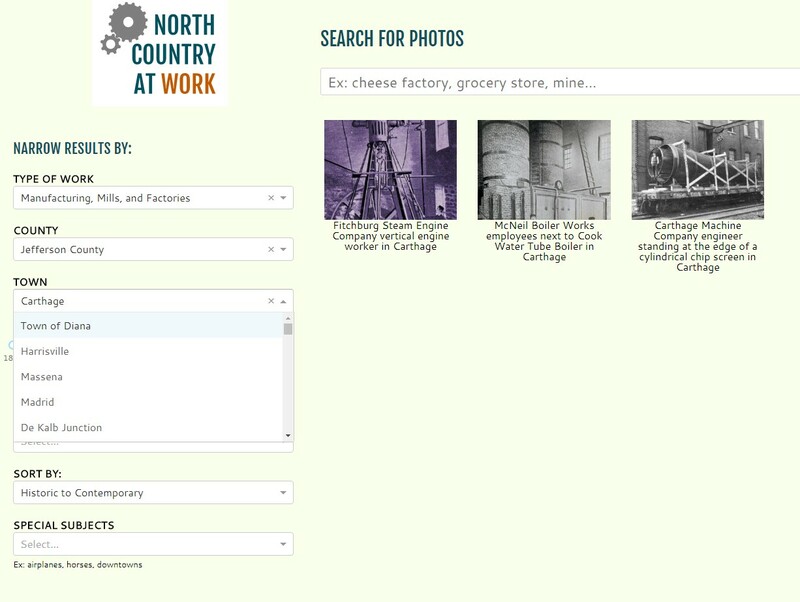 Another way to search is by using the top search bar, which searches through the text of captions for all the photos in our database. If you are looking for a particular place (ex. a river, a small hamlet), person (ex. Betty Edwards), tool (ex. thresher), this is where you can type in key words and phrases and search through all archive item captions. Make sure to press go! for results. Once you have found an interesting set of photos, click on any of the displayed photos and they will pop up into a separate window showing their basic details; you can also cycle back and forth between the photos using the arrows on the right and left. If you want to learn more about a photo and see it in a larger size, click “View Details” and you will get a full page view of the photograph.